The sprite of Jason in the NES game cover/New Blood pose, the NES counsellors and Crystal Lake background were done for the last DangerTerrorHorrorThon 2014 update on ScrollBoss, which happened to fall on Friday the 31st. 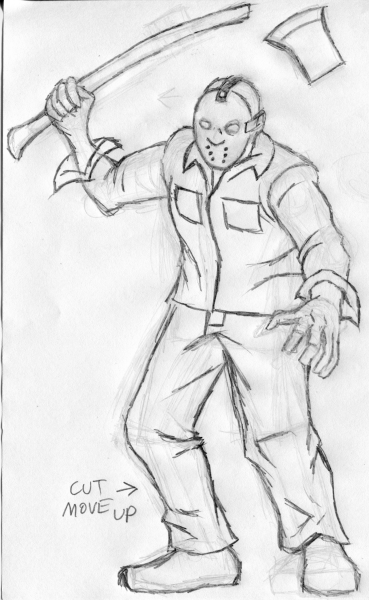 Jason's pose is based on the same still from “Friday the 13th: The New Blood” that was used for the Friday the 13th game cover. The counsellor poses are based on the sprite used in that NES game and ScrollBoss' image generators have extra palettes based on the counsellor shirts from 1958. 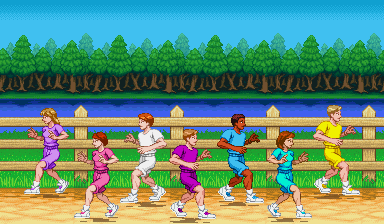 I realize the poses look a little Scooby-Doo-ish (and this was confirmed when my 7-year-old niece said the same thing), but I wanted to keep that NES pose while making them look like they're reacting to Jason. The clouds in the night version of the NES stage remake are based on the movie poster because I'm an a-hole who likes throwing stuff like that in there. The daytime version has no clouds because I'm lazy. The plain standing sprite from 2013 was done for a ScrollBoss update on Friday the 13th that featured other hockey mask-wearing characters. I'm pretty sure I pulled the colors from this to use in the recent sprite. 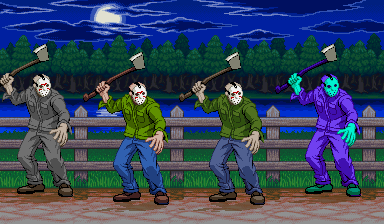 The SFA3-style portrait for Jason was made for the Friday the 13th update on June 13th, 2014.